^ Buckingham 2004, p. 15. ^ 2.00 2.01 2.02 2.03 2.04 2.05 2.06 2.07 2.08 2.09 2.10 2.11 2.12 2.13 "Dieppe raid." Canada in World War II, 7 June 2010. ^ 3.00 3.01 3.02 3.03 3.04 3.05 3.06 3.07 3.08 3.09 3.10 3.11 3.12 3.13 3.14 3.15 3.16 Thompson, Julian. 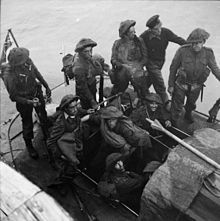 "The Dieppe Raid." BBC (World Wars in Depth series), 6 June 2010. ^ 4.0 4.1 "OperationJubilee." Combined Operations, 7 June 2010. ^ "Warning by Radio: Notice of 'Likely' War Moves Given Civilians in Nazi-Held Zone." The New York Times, 9 June 1942. Retrieved: 9 September 2010. ^ Beattie, Edward W. "Big Commando Attack Due, England Hints." Pittsburgh Press, 8 June 1942. Retrieved: 9 September 2010. ^ Henry 1993, p. 6. ^ No. 35729. London Gazette (Supplement). 2 October 1942: 4328 [10 January 2008]. ^ 9.0 9.1 No. 35729. London Gazette (Supplement). 2 October 1942: 4323–4324 [17 April 2008]. ^ No. 35730. London Gazette (Supplement). 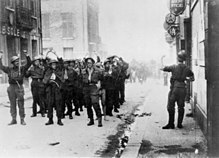 2 October 1942: 4339 [17 April 2008]. ^ Dunning 2003, pp. 65–87. ^ Goldstein, Ron. "Jack Nissenthall: The VC Hero Who Never Was (Part 1a)." 互联网档案馆的存檔，存档日期2011-02-12. BBC (WW2 People's Story series), 2004. Retrieved: 30 April 2009. ^ Leasor, James. Green Beach: The True Story of One Man's Courageous Mission that Changed the Course of World War II. London: Corgi Books, 1976. ISBN 0-552-10245-8. ^ "Mortar platoon." 互联网档案馆的存檔，存档日期2005-12-15. calgaryhighlanders.com. Retrieved: 8 April 2010. ^ "Lyster and Pittaway." 互联网档案馆的存檔，存档日期2010-12-31. Harry Palmer Gallery. Retrieved: 8 April 2010. ^ http://www.cwgc.org/search/casualty_details.aspx?casualty=2146695 Casualty Details—Insinger, Theodor Marie], Commonwealth War Graves Commission. ^ Taylor 1976, p. 193. ^ Allason, James. The Hot Seat. London: Blackthorn, 2006. ISBN 0-900-91376-2. ^ Pagtakhan, Rey D. "Speaking notes: Ceremony at Dieppe Canadian War Cemetery." Veterans Affairs Canada, 19 August 2002. ^ "RAF timeline 1942." 互联网档案馆的存檔，存档日期2010-12-06. Ministry of Defence (United Kingdom), 7 June 2010 via raf.mod.uk. Retrieved: 11 September 2010. ^ Stacey 1944, paragraph 43. ^ Poolton and Poolton-Turney 1998, p. 46. ^ Whitaker 1992, p. XV. ^ "Mystery of the D-day crosswords, Part 1." 互联网档案馆的存檔，存档日期2012-01-19. Daily Record7 June 2010. ^ Gilbert 2008, pp. 19–20. Alexander, Joseph H. Storm Landings: Epic Amphibious Battles in the Central Pacific. Annapolis, MD: Naval Institute Press, 2009. ISBN 978-1557500328. Buckingham, William. D-Day: The First 72 hours. Stroud, Gloucestershire, UK: Tempus Publishing. 2004. ISBN 0-75242-842-X. Churchill, Sir Winston. The Second World War. Cambridge, Massachusetts: The Riverside Press, 1953. Dunning, James. The Fighting Fourth. Stroud, Gloucestershire, UK: Sutton Publishing, 2003. ISBN 0-7509-3095-0. Gilbert, Val. A Display of Lights (9): The Lives and Puzzles of the Telegraph's Six Greatest Cryptic Crossword Setters. London: Macmillan (Telegraph Group Limited), 2008. ISBN 978-0230714465. Henry, Hugh G. "Dieppe Through the Lens of the German War photographer." London: After the Battle, 1993. ISBN 0-900-91376-2. A Canadian historian covers the actions of each one of the 29 tanks disembarked on the raid with photos, oral history and primary sources. The author later did his PhD dissertation on the raid. Leasor, James. Green Beach. London: Corgi Books, 1976. ISBN 0-552-10245-8. Poolton, Jack with Jayne Poolton-Turney. Destined to Survive: A Dieppe Veteran's Story. Toronto: Dundurn Press 1998. ISBN 1-55002-311-X. Stacey, Colonel C.P. "The Lessons of Dieppe. "[永久失效連結] Report No. 128: The Lessons of Dieppe and their Influence on the Operation Overlord. Ottawa, Canada: Department of National Defence Canadian Forces, 1944. Taylor, A.J.P. The Second World War: An Illustrated History. London: Penguin Books, 1976. ISBN 0-14004-135-4. Villa, Brian Lorring. Unauthorized Action: Mountbatten and the Dieppe Raid. Oxford, UK: Oxford University Press, 1991. ISBN 0-19540-679-6. Whitaker, Denis and Shelagh. Dieppe: Tragedy to Triumph. Whitby, Ontario: McGraw-Hill Ryerson, 1993. ISBN 0-07-551641-1. No. 38045. London Gazette (Supplement). 12 August 1947: 3823–3828 [10 January 2008]. Operation Jubilee Official despatch and narrative submitted by Naval Force Commander Captain John Hughes-Hallett on 30 August 1942.